Le’Veon Bell’s refusal to sign his franchise tender has been an attempt to leverage his value to the Steelers’ offense. Bell is a running back skilled at catching passes and running routes, and he’s been a workhorse for a perennial playoff team with one of the NFL’s most efficient units. As such, Bell made a business decision—to preserve his body, and to show the Steelers what they might be missing as a result of his absence. 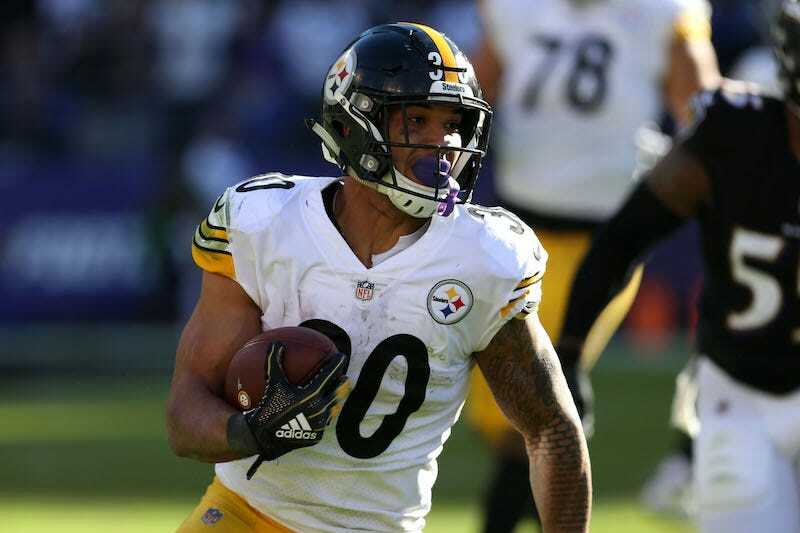 But his replacement, James Conner, has refused to cooperate with that calculation. That’s pretty comparable! Conner’s performance is certainly not anything anyone who wasn’t in the tank for him at the start of the season could have foreseen. To be clear: There were plenty of Yinzers who felt Conner was capable of Bell-level production, but it was easy to dismiss them as irrational homers pulling for him because of his extraordinary backstory. Conner played college ball at Pitt, which shares a stadium and a practice facility with the Steelers, and he survived a bout with cancer—specifically, Hodgkin’s lymphoma—that hit during his junior year with the Panthers. By all indications, Conner has been an outstanding member of the community, too. During last night’s game broadcast, when Fox’s Joe Buck described Conner as “one of the easiest players to root for in the NFL,” it was difficult to disagree. The Steelers drafted Conner in last year’s third round, and while he displayed some pass-catching promise as a senior at Pitt (21 catches, 302 yards, 4 TDs), he played just 6.2 percent of the offensive snaps as a rookie and only showed limited effectiveness behind Bell, whose 406 touches led the league. But Conner hit the ground running in Bell’s absence, with 135 rushing yards and five catches for 57 yards in the opener. In the first four games of the Steelers’ current five-game winning streak, he averaged 118.5 rushing yards, 5.4 yards per carry, and five catches for 53.8 yards. He’s now on pace for 2,059 yards from scrimmage. Last year, for an offense that finished third in DVOA, Bell was second in the league behind Todd Gurley (2,093) with 1,946 scrimmage yards. Conner (6-foot-1, 233 pounds), like Bell (6-foot-1, 225 pounds), is a big back. Fox’s Troy Aikman said during last night’s broadcast that Conner might lack Bell’s explosiveness, and he might not be quite as good of a route runner, but he’s certainly doing other Bell-like things when the Steelers get him the ball. According to Pro Football Focus, Conner is averaging 0.26 avoided tackles per touch; Bell has never averaged better than 0.22 across an entire season, and through nine games last season (which he finished at 0.15) his average was just 0.135. Also, per PFF, Conner has 33 avoided tackles in the run game this year, and 21 as a receiver. His 1.55 yards yards per route run exceeds the 0.93 Y/RR Bell posted through nine games last year. The Steelers haven’t been afraid to position Conner all over the formation, either: He’s lined up in the slot on 10.9 percent of his offensive snaps, compared to Bell’s 12.9 percent for all of last year. Conner could have put up even bigger numbers during Thursday night’s throttling of the Panthers had the Steelers not eased him out of the lineup for nearly the entire second quarter, as the game got out of reach. They eventually shut him down for good at the end of the third, though he sustained a concussion and will now have to clear the protocol. He’s got some time, however, since the Steelers don’t play again for another nine days. But after a 1-2-1 start, Pittsburgh has been on a tear and appears to be primed for another deep playoff run. And their offense, which looked so dysfunctional two months ago, now only seems to suffer from an embarrassment of riches. Bell has until 4 p.m. (EST) Tuesday to report back, or else he won’t be able to play at all this season, in addition to forfeiting the entirety of his season salary, which the franchise tag set at $14.54 million. Conner, meanwhile, will earn $578,000 this season, and he’s under contract for two more years at a similar rate. The Steelers haven’t yanked Bell’s tender, so they’d obviously still love for him to report. And if he does show, the Steelers would be wise to scheme up some plays with Bell and Conner on the field at the same time, the way the Patriots are fond of doing with their running backs. But, as Sean Gentille wrote this morning for the Pittsburgh Post-Gazette, Conner has by now certainly demonstrated that having Bell would be a luxury, rather than a necessity. What Does Todd Gurley&apos;s New Contract Mean For Le&apos;Veon Bell? Dom Cosentino is a staff writer at Deadspin.